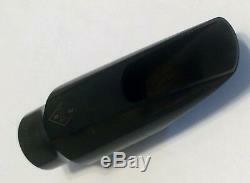 For sale is this outstanding vintage "New York" Meyer 3M alto saxophone mouthpiece. This mouthpiece features its ORIGINAL FACING and the tip measures roughly. The tip, rails, and table are in excellent condition, and the piece has naturally discolored with age. The only "blemish" is on the beak where a mouthpiece patch prevented the area from discoloring (see pic). There are no teeth gouges or other imperfections. This mouthpiece is super easy and fun to play, and it features that signature NY Meyer "pop" and "sizzle" that make these pieces so sought-after. I've owned a few of these over the years in various tip openings but hung-on to this one because I think it has something extra special. You can send it away to your favorite mouthpiece refacer or go up 1/2 a reed strength and play it as-is. An outstanding original example of this mouthpiece. Sure to go up in value. Please feel free to ask questions or request additional pictures. 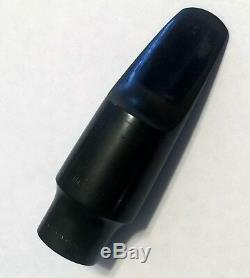 The item "Vintage New York Meyer 3M Alto Saxophone Mouthpiece (Original Facing!)" is in sale since Tuesday, January 15, 2019. This item is in the category "Musical Instruments & Gear\Wind & Woodwind\Parts & Accessories\Mouthpieces". The seller is "spottypippen" and is located in Cleveland, Ohio. This item can be shipped to United States, Canada, United Kingdom, Denmark, Romania, Slovakia, Bulgaria, Czech republic, Finland, Hungary, Latvia, Lithuania, Malta, Estonia, Australia, Greece, Portugal, Cyprus, Slovenia, Japan, Sweden, South Korea, Indonesia, Taiwan, Thailand, Belgium, France, Hong Kong, Ireland, Netherlands, Poland, Spain, Italy, Germany, Austria, Bahamas, Israel, Mexico, New Zealand, Singapore, Switzerland, Norway, Saudi arabia, Ukraine, United arab emirates, Qatar, Kuwait, Bahrain, Croatia, Malaysia, Chile, Colombia, Costa rica, Panama, Trinidad and tobago, Guatemala, Honduras, Jamaica, Barbados, Bangladesh, Bermuda, Brunei darussalam, Bolivia, Egypt, French guiana, Guernsey, Gibraltar, Guadeloupe, Iceland, Jersey, Jordan, Cambodia, Cayman islands, Liechtenstein, Sri lanka, Luxembourg, Monaco, Macao, Martinique, Maldives, Nicaragua, Oman, Pakistan, Paraguay, Reunion.